Ready for a new season of "Stranger Things"? Wonder what will happen next in the "The Handmaid's Tale"? Thinking about looking into "The Chilling Adventures of Sabrina"? Each of these shows has one major thing in common: They're exclusive, streaming content you won't find on standard cable. Today, video streaming isn't just about having access to old favorites like "Friends" or "Seinfeld" – it's a necessity if you want to keep up with award-winning shows like "The Crown" or "Black Mirror." While "cutting the cord" is supposed give you control over what you watch and save you a fair bit of cash over the price of cable or satellite TV, that isn't always the case. Being subscribed to streaming platforms for basic entertainment, exclusive titles, prestige dramas, and live sports can start to add up. Of course, your monthly entertainment expense won't be nearly as high if you're mooching a login here or there. With roughly 137 million Netflix subscribers around the world, there has to be at least one person willing to lend you their account, right? Read on as we break down the popularity of video streaming services according to over 1,000 people, which platforms get viewers the most excited, and how many are mooching off people for their subscriptions. Once upon a time, "cutting the cord" and saying farewell to exorbitant cable or satellite TV packages was a pipe dream. Today, the average viewer has access to at least one streaming subscription service, and that number is only going to continue to rise. Just 7 percent of viewers only used cable TV for their media consumption. Around 68 percent of people still used traditional cable, and nearly 92 percent used video streaming services for TV, movies, sports, or music. While 62 percent of viewers used both traditional cable and at least one streaming platform (like Netflix), nearly 30 percent exclusively subscribed to video streaming services. Switching from cable isn't free, and in some cases, it might not even save you money. Individual video streaming services may only cost a few dollars each month, but when you take into account how many options there are and how many provide exclusive content, your streaming subscriptions might get out of hand. Still, there's a fairly good chance you'll opt for the original: Netflix. Hailed as the "King of Binge," a Netflix subscription will set you back between $8 and $14 depending on the resolution and access you want. 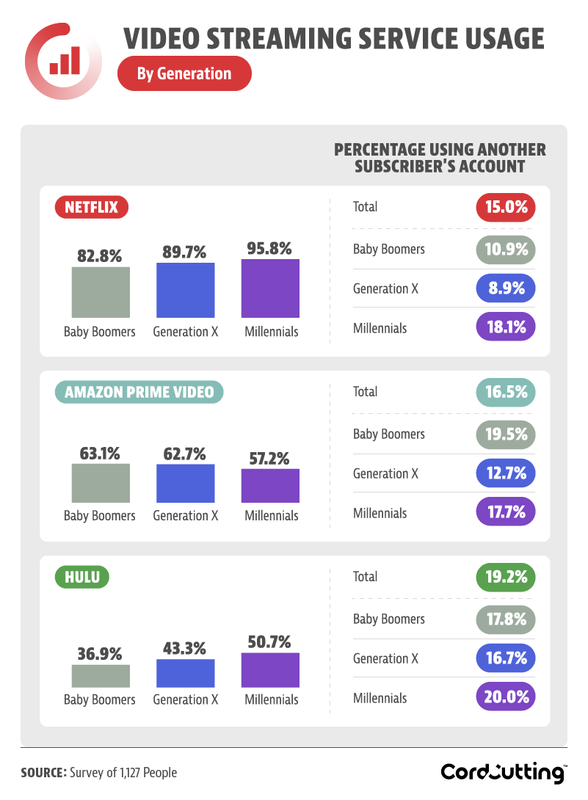 Compared to Hulu or Amazon Prime Video, Netflix was the most popular streaming platform for audiences of all ages and the least likely to be pirated by baby boomers or Gen Xers. Just 11 percent of baby boomers and 9 percent of Gen Xers admitted to mooching off someone else for their Netflix account. While Amazon Prime Video wasn't as popular as Netflix, baby boomers were nearly twice as likely to "borrow" someone else's account to access Amazon's content. While giving out your login information violates the sharing policy of most providers, Amazon allows for family members (within the same household) to take advantage of each other's Prime status, including Prime Video. With as many as 1 in 5 people mooching Amazon Video, Hulu, or Netflix account information from someone else, we asked viewers about the people who paid for these video streaming services. As is often the case with young adults' cellphone bills, car insurance, and even rent in some cases, parents were the most likely to foot the bill for streaming services among nearly every platform. Nearly 48 percent of people mooching Netflix said they got the login from their parents, while another 14 percent took their credentials from a sibling. 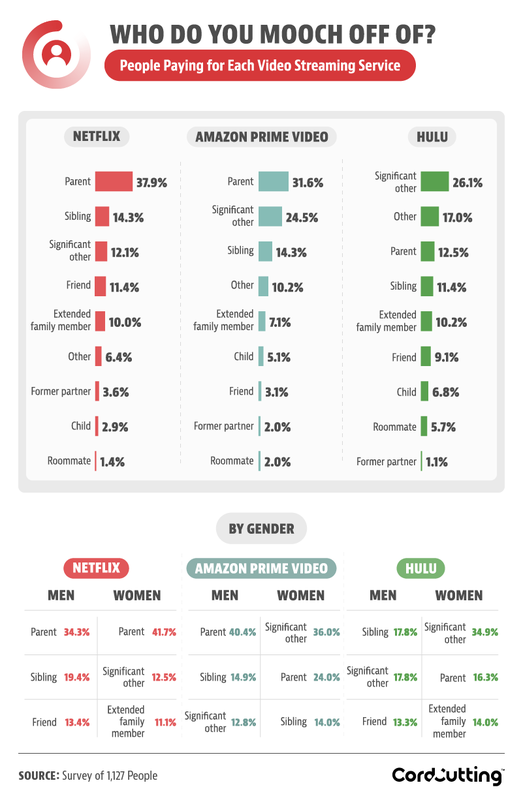 Parents were almost as inclined to offer up their Amazon Prime Video subscription, but significant others ranked as the top source for Hulu access. Parents still contributed to nearly 13 percent of shared Hulu accounts, but significant others were responsible for 26 percent of the blame. Most people don't borrow someone's login to watch a single show over one evening. On average, people mooching a Netflix subscription used the borrowed account for 26 months. At the lowest price of $7.99 a month (more for high definition or 4K), that's a savings of over $207 per person. Viewers taking advantage of an available Amazon Prime Video login used the account for a shorter period, adding up to 16 months, on average, and nearly $144 in savings. Hulu had the shortest mooching retention – 11 months for a savings of nearly $88. Saving a few dollars a month on your subscription over a year (or more) can equate to hundreds saved per person. Of course, the losses for the companies are much greater. With 137 million subscribers and roughly 15 percent of users sharing their login information with at least another person at $7.99 a month, Netflix could be losing an estimated $192 million every month and $2.3 billion every year. The losses for other subscription services could be less substantial but still incredibly high. Hulu and Amazon Prime Video average between $40 and $45 million in estimated losses each month due to people using their services without paying for them. In some cases, sharing streaming subscriptions is about the cost of the account. In others, it might just be a matter of convenience. Assuming they lost access to their shared Netflix login, around 59 percent of people would be willing to pay for their own subscription. Women (almost 74 percent) were more willing to fork out the monthly payment than men (nearly 45 percent) and also happened to watch an average of 509 hours of Netflix every year (50 more hours than men). 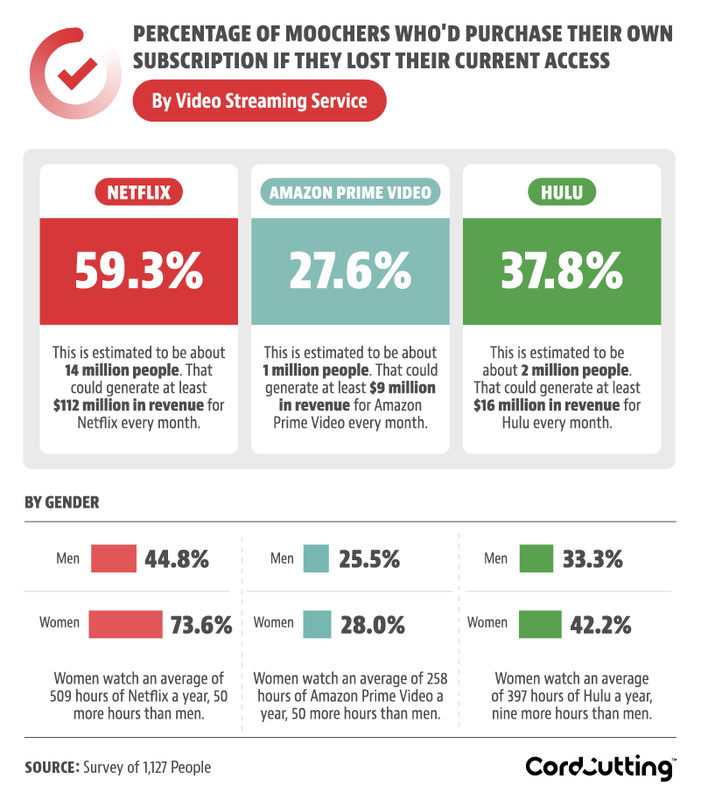 Viewers were less willing to consider starting their own subscription for either Amazon Prime Video (nearly 28 percent) or Hulu (almost 38 percent). What may have originally started as a mail-order DVD company has changed the way many consumers watch TV forever. After introducing streaming to its viewers, Netflix now champions its original and exclusive content to keep viewers coming back. Perhaps even more importantly, competitive streaming platforms have followed suit, and even cable companies are responding to remain competitive. But having access to all of these services can get expensive, and sharing your login with someone else is sometimes just as easy as paying for it yourself. While many were willing to pay for their accounts, many people mooch their streaming accounts (mostly from their parents and significant others), costing providers like Netflix millions of dollars in losses. For this project, we surveyed 1,127 people using Amazon's Mechanical Turk. 50.9 percent of our participants were men, and 49.1 percent were women. Participants ranged in age from 18 to 81 with a mean of 37 and a standard deviation of 11.9. Respondents were disqualified from the survey if they didn't use a video streaming service. However, respondents who were disqualified had their responses used in the first graphic we presented. 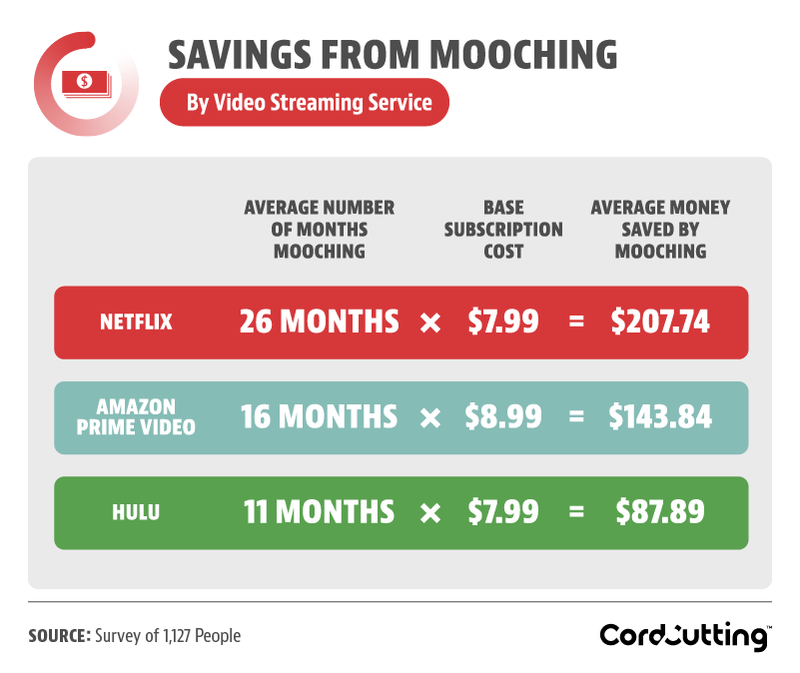 We defined mooching as anyone who used a streaming service but did not pay for it. We went to each streaming service website and found their base streaming package price. These prices were the bare minimum price a person could pay to use the streaming service. We used those base prices and the reported total number of subscriptions to make estimations. Since we only used base streaming package prices, our estimations are labeled as "at least." 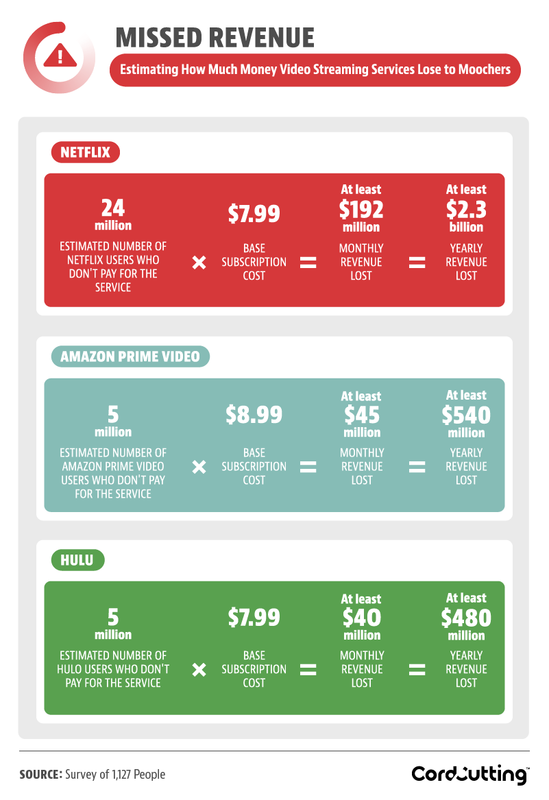 This means that the estimations we calculated were the minimum amounts possible because people can pay more for each streaming service if they chose a package that was more expensive than the base. To find the estimated number of users who didn't pay for a service, we divided the reported number of subscribers from each service by the percentage of people who pay for the service they watch. We then found the difference between the number of total subscribers and the number of total users. Netflix had a reported 137 million subscribers, and our survey found 85 percent of people who use Netflix pay for it. This gave us an estimated 161 million total users. Amazon Prime Video had a reported 26 million subscribers, and our survey found 83.5 percent of people who use Amazon Prime Video pay for it. This gave us an estimated 131 million total users. Hulu had a reported 20 million subscribers, and our survey found 80.8 percent of people who use Hulu pay for it. This gave us an estimated 25 million total users. Binging on our study results? No need to mooch –feel free to share them (for any noncommercial use) with your readers with a link back to this page as a credit to our contributors.